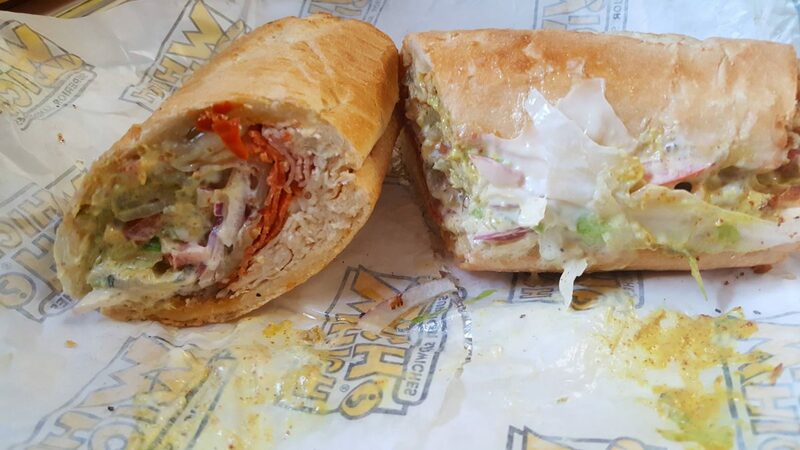 I am not normally a sandwich person and am usually dissatisfied with the standard Subway style sandwiches you get from most places. Even worse are the cold cuts on sliced bread places which basically charge you for something you could easily make at home. Also, since food is something I enjoy, there is just something unsatisfying to me about wasting a meal eating a mere sandwich. 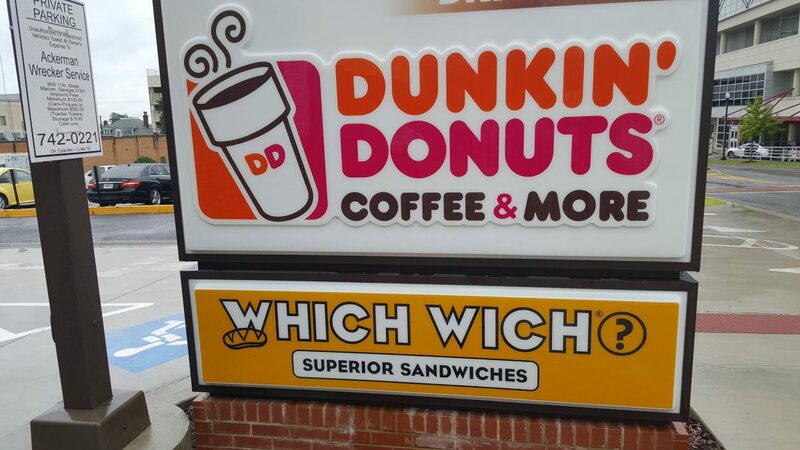 Which Wich is located across the street from the Emergency Departent of the Medical Center and shares a building with Dunkin Donuts. Photo by Doug Deal. Sometimes, though, a good sandwich can hit the spot, especially for lunch and especially when in a hurry. 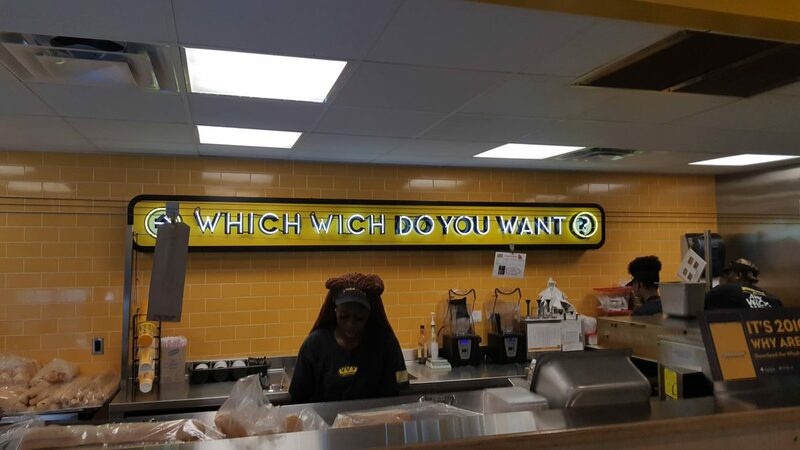 Once place to consider is Which Wich. It’s a chain, which is not usually the type of restaurant we cover, but there is a such a large gap in the options for local quick service sandwich places in Macon, that we’ve made an exception. Across from the Medical Center and next to Dunkin Donuts, the restaurant offer a large selection of sandwiches (over 40) and several options for bread, toppings, meats and cheese. For those who like sandwiches served on bread but want to cut back a little, they have a “skinny” options which is a regular roll with the middle scooped out. This removes a bit of the calories and carbs from the sandwich, but still gives the sensation of eating a real sandwich. 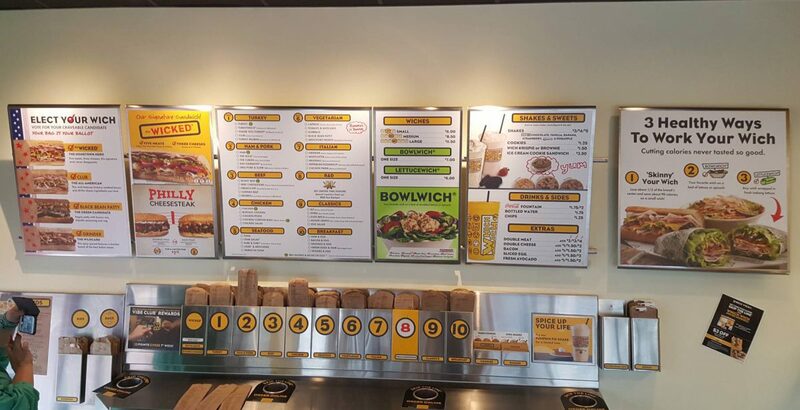 Which Wich has a large menu of sandwich divided up into 10 categories. Each category has its own bag from which you record your selections. Photo by Doug Deal. The sandwich sizes start with a 7-inch and include a 10.5-inch and a 14-inch. The 7-inch is a fairly large portions, so most people will find that acceptable and the 14-inch is perfect for sharing. For those who want no bread at all, they will also serve the sandwich in a bowl as a salad or inside a lettuce wrap. If you choose a bread, you also have the option of having it toasted as a “hotwich” or not as a “coldwich”. Cheese options include the usual like cheddar, Swiss, American and provolone, and also include mozzarella, blue, pepper jack and Parmesan. Different sandwich allows for differing amounts of cheese and most sandwiches allow you to double the cheese for a $1.00 or the meat for $2.00 on a 7-inch. You sandwich is prepared while you wait by the specifications you marked on your bag when you placed your order. No need to stand around and repeat your request to three different people. Photo by Doug Deal. There are also a number of dressings available, starting with your basic mayos like regular and spicy, and mustards like deli, yellow and Dijon. But there are also several more exotic options like Balsamic vinaigrette, Buffalo, ranch and pesto. Toppings can be chosen from lettuce, spinach, tomato, pickles, onions, mushrooms, avocado, sliced egg and many more. Pretty much anything you might want on a sandwich is available. When confronted with so many options, it is easy to get a bit mixed up and leave something out, which is where one of their innovations comes in. If you don’t order online, which is highly recommended, you select what type of your sandwich you want from 10 different categories. After selecting the appropriate numbered bag, you mark your selections in pencil and the crew uses that as their guide in preparing your sandwich. If you leave something off, the cashier will ask you about it and fill it in at the register. This greatly reduces errors and in the few times I have been there, I have not been on the receiving end of a mistake. The Wicked is a meat lovers dream, having pepperoni, ham, roast beef, bacon and turkey. It also comes with three kinds of cheese of your choice. This is the 7-inch and is big enough for almost anyone’s lunch. Photo by Doug Deal. The restaurant is on the small side, like most sandwich places, but if you hit the off peak times, there is rarely an issue with finding a table. Generally, I have gotten mine to go and you are usually in an out before too long. My current favorite sandwich is The Wicked, which is a meat lover’s dream with turkey, roast beef, bacon, pepperoni and ham. It is also served with your choice of three kinds of cheese. The 7-inch was more than enough for lunch and comes in at $7 plus tax for the sandwich only and $10 for the sandwich with chips and drink. It’s a bit more pricey than Subway, but not too much more and the quality AND quantity make it worth the extra money. There is only one location in Macon, 860 Forsyth St. Ste. 102, Macon, GA 31210, but another is listed as coming soon at Mercer University.